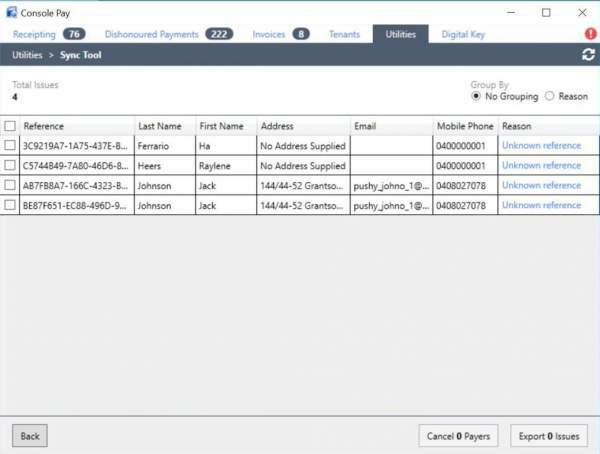 Following a restore running the Sync Tool determines if you have any data inconsistencies between Gateway and Console Pay i.e if you have entered any new tenants/properties/payers since your last backup date and then you restore, you may need to re-enter these entities to allow Console Pay and Gateway data to sync. Following a restore go to Transactions, Console Pay click Utilities then Start Sync Tool. Once the data is re-entered into Gateway and inconsistencies remedied, we recommend re-running the Sync Tool to ensure all changes have been fixed – a blank list will display.